The Scottish government has decided not to back calls for a public inquiry into the safety of helicopters servicing the oil industry. Unions have been calling for a public inquiry following a number of fatal accidents involving Super Puma helicopters in recent years. Energy Minister Paul Wheelhouse said in a letter to MSP Lewis Macdonald it was not felt such an inquiry would assist work already being done. Unions leaders criticised the decision. Aviation safety is a matter reserved for the UK government. In the letter, Mr Wheelhouse said that "while sympathetic to the underlying concerns" the Scottish government did not think a public inquiry at the current time would add to ongoing work. North East Labour MSP Mr Macdonald said it was "deeply disappointing". Unite and the RMT also expressed disappointment at the stance. 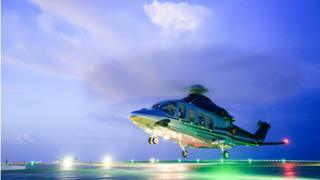 RMT general secretary Mick Cash said confidence in the safety of the offshore helicopter fleet had "seriously declined".